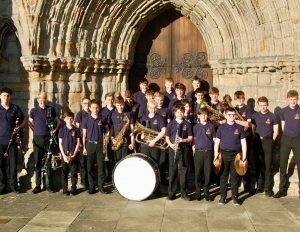 Thirty young musicians from Dunblane Boys’ Brigade will be heading to Germany on Thursday (2nd August) for a week-long tour. The boys are all members of the 40-strong Boys’ Brigade band in Dunblane as well as three BB members who are bagpipers, an instrument always guaranteed to help please a crowd in Germany. Heading off by coach on Thursday lunchtime, the boys will arrive in Bacharach in the Rhineland, above the steep-sided gorge of Europe’s busiest river and one of Germany’s most scenic tourist areas, where they will stay in a converted castle youth hostel. Three concerts will follow in quick succession: in Rudesheim on Saturday, Bad Ems on Sunday and in Bad Münster am Stein-Ebernburg on Tuesday. In between, the boys will enjoy a ‘day off’ at the huge Phantasialand theme park on Monday, and will visit a number of other historic attractions on their concert days, too, as well as Cologne Cathedral on the way home. The band will perform a variety of music, including both Scots and German favourites, movie medleys, marches, original concert band works, and some rousing combined numbers for bagpipes and wind band together. A highlight promises to be a march specially written for the trip by Robert Cowan, Bandmaster of the Regimental Band of the Black Watch Army Cadet Force, entitled ‘Grüße aus Dunblane’ (Greetings from Dunblane) which combines famous ‘Scotland the Brave’ and ‘On the Banks of Allan Water’ with the German national anthem and the local folk song ‘Die Lorelei’. “The boys have worked really hard towards this tour. They’ve not had a summer holiday from rehearsals, which have continued non-stop all year! “This is only the second time the BB boys have been abroad following our trip to Malawi in 2016. The band would particularly like to thank North Sea Plastics for its generous financial support of the trip as well as everyone who has attended the band’s recent performances and fundraising events. You can follow the band's tour on Germany via the Company's instagram, twitter and facebook accounts (@dunblanebb).